Light, particularly sunlight, is believed to be good for our health. Many ancient civilisations even attributed it with mystical healing powers.Renowned for his entertaining lectures, Professor David Phillips, President of the RSC, uses his expertise in photo-medicine to demonstrate that there is both truth and fallacy in such beliefs. 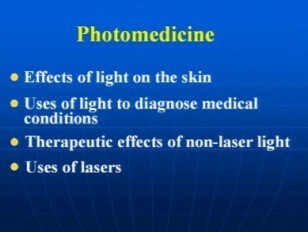 Today doctors use light in many ways, including recent revolutionary applications of lasers in surgery. Exploring the effects of light on the skin, David demonstrates how light is used to diagnose and treat problems like skin complaints and neonatal jaundice in modern medicine.